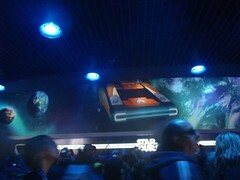 The new Star Tours ride was the main reason we went to Disneyland the first weekend of June. The lines were crazy long on Friday, June 3 when it opened, but first thing Saturday the lines were surprisingly short. Also, we were able to snag some Fast Passes before getting in line for only an hour wait to ride the first time. 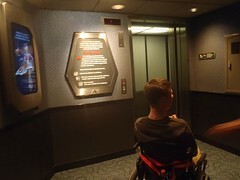 The wheelchair entrance remains a side door and elevator ride to the loading area, but now the queue wraps around more outside and you get to go in a small room with some cool Star Wars decor as part of the queue before you get to the actual ride building and the CM directs you to a side door to the elevator. 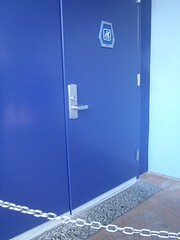 Note that it seems that they also load some disabilities from the exit. It seems some get to the side doorway and are told to go to the exit, but we have never been told that. I think it is because larger power chairs and scooter cannot get through the ride vehicle very well and those type load from exit, while manual chairs like Mik load from the regular side. The path to the elevator is pretty much the same, although there is a new electronic screen that shows information about the ride. The elevator is rather boring. 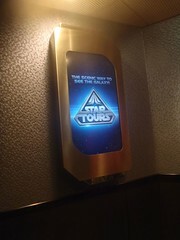 If you going to have to skip the regular queue, it would be nice if the elevator was at least Star Wars themed or something like the awesome elevators that you go on for the Indiana Jones accessible queue route. Mik was sad he still did not get to see whatever might be cool about the inside the building queue (I have heard they added some cool stuff), but at least we get the full ride experience loading from the same side as most everyone else. However, we always have to sit in the front row and I really wonder how the experience differs by row. This is a transfer ride, but one of the easiest because it really is just a chair to chair transfer, especially since the armrest on the end of the front row swings back out of the way to make a transfer easier. However, it does seem it would be a tight squeeze if you tried to put the chair right next to the seat to transfer over, but we did not even try because that does not work best for Mik anyways. After you transfer, the CM takes the chair back out and then brings it back to you after the ride. You then go out and exit the way down the ramp into the Star Wars store. I really wish the exit was not the store, though, as it gets quite crowded and there, but that is how it has always been. 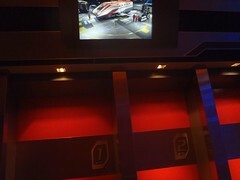 Star Tours - The Adventure Continues is similar to the old ride, but now it is 3D and the adventures are different. This includes there being 54 different variations on the ride. That makes it more interesting to ride multiple times every visit. My favorite of the three times we rode was when we ended up in a pod race. That was totally awesome, as that has always been my favorite aspect of the Star Wars universe. The 3D aspect is a cool addition, but it really is not that great. I found that it was like with my 3DS that you have to look just right at the screen. However, the ride also requires the glasses to sit just right on your head, which is really hard for me when they have to go over my glasses. 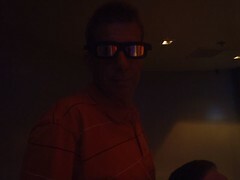 The 3D glasses did not mesh well with my glasses coverage, so half the time the movie looked funky. Mik nor Dad understood what I was talking about, but Mik amazingly has awesome eyesight and Dad's is not that bad. Also, the fact my glasses are crooked and actually work better when crooked might play into the problem, but I never have that problem with 3D movies in theaters. It might have to do with the ride moving and the glasses not being that snug on small heads like mine. Looks cool wish I could go.